We absolutely love getting our hands on new clients, helping them to get the most out of the lucrative market based our on knowledge, experience and expertise. This year we were delighted to welcome Paperchase to our growing portfolio. 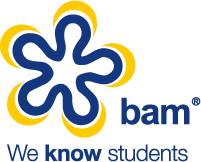 Paperchase is the UK’s number 1 shopping spot for exciting and innovative design-led stationery and they approached BAM looking for support with their Freshers Campaign. Their main objectives were to increase brand awareness within the student market whilst capturing valuable student data that could be used to re market to in the future. Being such a creative and innovative brand their campaign needed to reflect their image. After some serious brainstorming we opted for a 7ft Plinko Board for the creative concept which would give students the chance to play to win some amazing prizes. For those who are not familiar with a Plinko Board, it originated on the classic TV game show, The Price is Right way way back in the 80s. The aim of the game is to drop a coin into the board at the top and watch it bounce and bump its way down into one of a number of slots at the bottom. The plinko board provided a platform or excitement and engagement with students, drawing crowds as students watched tentatively to see where their coin would land. After registering to play through our data collection app, students had to the chance to win an array of prizes from a lucky dip on Paperchase merchandise to a gift card to spend in store. To increase the element of mystery and surprise, if a student’s coin landed in a “win” slot they were handed a scratchcard from our talented promotional staff, which held the details of their prize. Students eagerly scratched away to discover what they had won. Paperchase attended 7 Freshers Fairs in total covering locations from Newcastle down to London. Paperchase received an amazing response at the Fairs and students were genuinely excited to see them at the event. Reactions like this emphasise the need for brands to connect with students at this pinnacle time of year. With this in mind it comes as no surprise that Paperchase smashed their objective to raise brand awareness whilst collecting thousands of pieces of student data in the process. After the success of this years campaign and the obvious demand for their brand in the student market, we look forward to continuing to work with this exciting brand into 2019.